Storm promotes Gary Kloppenburg to interim head coach, but can he salvage the season with eight games left? 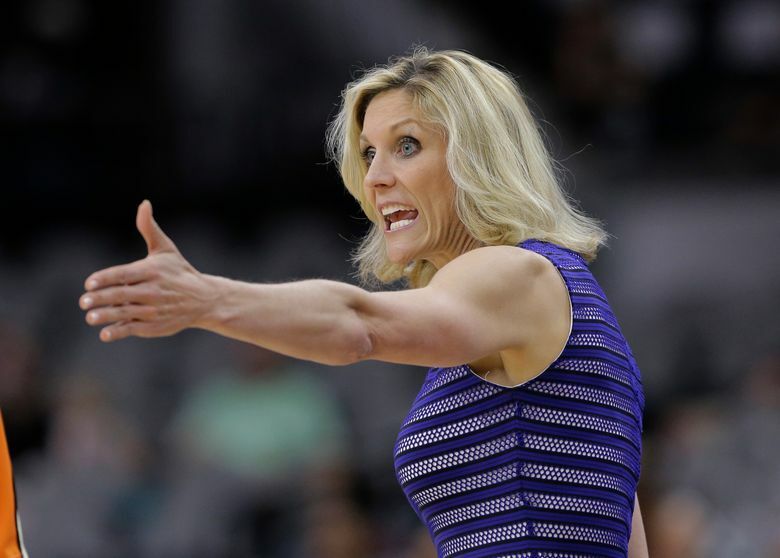 In the wake of a disastrous defeat two days ago that pushed its losing streak to four consecutive games, the Storm fired coach Jenny Boucek on Thursday, marking the first time the 18-year-old franchise has made a coaching change during the WNBA season. “I believe new leadership is needed at this time to give our team the best chance at short and long-term success,” Storm president and general manager Alisha Valavanis said in a statement released by the team. Assistant Gary Kloppenburg has been elevated to interim coach. The Storm entered this season as a darkhorse title contender considering its cache of firepower in reigning Rookie of the Year Breanna Stewart, 10-time WNBA All-Star Sue Bird and promising young star Jewell Loyd. However, Boucek has received much of the criticism for the team’s struggles. Seattle is in a three-way tie with Chicago and Atlanta for eighth in the playoff race with a 10-16 record. Eight teams advance to the postseason in the 12-team league. Only eight games remain for Seattle, which ends its five-game road trip on Saturday at Phoenix. The end for Boucek came shortly after an 84-71 loss on Tuesday at Connecticut when Seattle blew an 11-point point lead in the fourth quarter and was outscored 33-9 in the final period. The game served as a metaphor for the season and another indictment on Boucek’s inability to coax her team to wins in the final minutes. Seattle started 4-1 and rose to second in the Western Conference standings March 28 with a 94-70 victory over Indiana that proved to be the season’s brightest moment. Since then, the Storm is 6-15 and has defeated just one team with a winning record. Boucek often cited inconsistency but was vague on specifics when asked about Seattle’s problems. She acknowledged defensive rebounding, turnovers and an inability to win close games (the Storm is 2-8 in the past 10 games decided by 10 points or fewer) has attributed to the team’s woes. Additionally, Storm fans complained about the offseason decision to forgo possible trade talks to acquire the top overall pick in the WNBA draft, which was used by San Antonio to pick former Washington Huskies star and fan favorite Kelsey Plum. Instead, Seattle swapped its first-round pick (No. 6 overall) for veteran center Carolyn Swords. The 6-foot-6 rim protector started 56 games the previous two seasons in New York where she averaged 5.2 points and 4.3 rebounds. The six-year veteran has not started for the Storm and is averaging 2.0 points and 1.5 rebounds — both career lows. The Storm’s problems were cast in the spotlight during last month’s WNBA All-Star weekend that was held at Seattle’s KeyArena. Many league observers questioned if Boucek was the right coach for Stewart and Loyd, two of the league’s brightest young stars. However, Valavanis essentially put Boucek on notice publicly when she declined to give a vote of confidence or commit to Boucek for the remainder of the season in a story by Summit Hoops published July 27, which cited unnamed players who criticized Boucek’s coaching acumen and decision-making. In response to the reported criticism, Boucek said: “(The players) responded to the tabloids,” following a 109-93 win over Dallas on July 28. It was a record-setting performance for Seattle, which shot a franchise-best 61.5 percent from the field and tied all-time team marks with 40 field goals and 29 assists. The Storm also finished two points shy of the franchise scoring record. It was also the last victory for Boucek, who ends her three-year tenure at 36-58 after taking over in 2015. Seattle was 10-24 in 2015 and missed the playoffs. Last year, the Storm was 16-18 and lost in the first round of the playoffs. The immediate question facing the Storm: Can Kloppenburg resurrect a season that promised more? The 14-year WNBA veteran re-joined the Storm in January, began his WNBA career in Seattle (2000-02) and spent the past two seasons (2015-16) as an assistant with the Indiana Fever. Kloppenburg was a head coach at Tulsa (2012-13) where he compiled a 20-48 (.313) record and did not make the playoffs in two years. Beyond this season, it remains to be seen what impact the coaching change will have on a talented roster, most notably Bird. Since being taken No. 1 overall in the 2002 draft by Seattle, she has played for five Storm coaches and developed a close connection with Boucek. In many ways, Boucek designed the offense around its future Hall of Fame point guard who has been able to play at a high level despite being the oldest player in the WNBA at 36. Boucek, who was an assistant on Storm teams that won WNBA titles in 2004 and 2010, was one of the few ties to the franchise’s glory days. Now only Bird remains, and Boucek’s departure may hasten retirement talks for the 15-year veteran who is on pace to set the WNBA’s all-time assists record this season.